American, Russian and Spanish astronauts set sail to the International Space Station this morning, safely rocketing into Earth orbit atop a Soyuz rocket from the Baikonur Cosmodrome in Central Asia. The three veteran space fliers embarked on their two-day journey to the orbiting facility at 0538 GMT (1:38 a.m. EDT) from the same launch pad where Yuri Gagarin began the first human spaceflight 42 years ago. Nine minutes later, the Soyuz spacecraft achieved the planned orbit. "I want to congratulate our Russian partners," Bill Readdy, former astronaut and NASA's associate administrator for spaceflight, said shortly after the liftoff. "Beautiful launch, just spectacular." Expedition 8 commander Michael Foale, flight engineer Alexander Kaleri and European Space Agency's Pedro Duque should reach the station early Monday, docking their Soyuz TMA-3 capsule to the Pirs module around 0716 GMT (3:16 a.m. EDT). Foale, making the sixth space mission of his career, becomes the fourth American astronaut and second British-born person to fly on Soyuz. 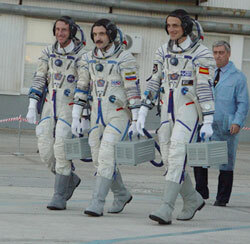 Russian cosmonaut Kaleri is on his fourth spaceflight following three trips to Mir. For the Spaniard Duque, this is his second mission following a space shuttle flight five years ago. Foale and Kaleri are slated to spend six months living aboard the station to maintain its systems and oversee scientific research while construction of the complex is paused. Continued station assembly hinges on NASA's space shuttles, which remain grounded in the wake of the Columbia disaster. 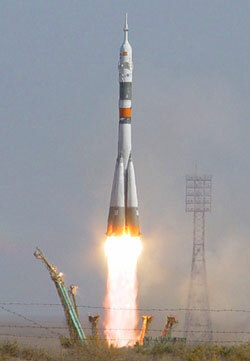 Resumption of shuttle missions is not expected before September 2004. Duque is only visiting the station, flying up with Expedition 8 and returning home later this month with the outgoing Expedition 7 crew. His 10-day mission, under an arrangement between the European Space Agency and Rosaviakosmos, the Russian Aviation and Space Agency, features a variety of experiments in life and physical sciences, Earth observation and educational activities. The station's current residents -- Expedition 7 commander Yuri Malenchenko and NASA science officer Ed Lu -- have logged a half-year in orbit. They were launched aboard the Soyuz TMA-2 spacecraft in April as the first "caretaker" crew tasked with the job of keeping the station afloat in the absence of regular shuttle visits. "Keeping crew onboard is extremely important because without crew the station runs the risk, and we estimate five times greater risk, being lost due to systems failures that can't be repaired without a crew," said Charlie Precourt, former astronaut and deputy space station program manager. "So each and every launch like today's is critical to the future life of the space station." Expedition 7 will give their duties to Expedition 8 during eight days of handover activities following Monday's docking. The Soyuz TMA-2 capsule presently parked at the station will ferry Expedition 7 back to Earth with landing expected around 0236 GMT on October 28 (9:36 p.m. EST Oct. 27) to conclude 185 days off the planet. Expedition 8 is expected to spend 194 days in space. Their mission will include the arrival of three unmanned resupply ships, a major upgrade to onboard computer software and a spacewalk outside the Russian section of the station. More than four dozen science investigations are planned as the crew dedicates over 300 hours to the research. Once Expedition 7 and Duque depart, Foale and Kaleri won't see another person until the next replacement crew launches next April. Saturday morning's liftoff marked the second human space launch of the week, coming two days after China's first manned mission successfully concluded. Taikonaut Yang Liwei orbited Earth 14 times in 21 hours, solidifying his place in history. China became the third nation, behind the Soviet Union and the United States, to launch a person into space. "We see this as a positive event and hope China will be following the path of the piloted spaceflight," Kaleri said Friday. "We also hope in the near future we can cooperate." "We had hoped we would have the chance to maybe welcome or congratulate the Chinese while we were on-orbit or in space on the International Space Station," Foale added. "But they managed to do their accomplishment, their feat, sooner than we were able to launch. I do not think that is a sad thing, I think that is a testament to their success. We hope that their adventure continues."